If your actions inspire others to dream more, learn more, do more and become more, you are a leader. I not only subscribe to these words of wisdom by former American President John Quincy Adams personally but also endorse the same for all of you collectively. It is with this frame of mind that I have put our professional ‘Leadership and Influence’ high on my agenda for this year while marching towards new frontiers. The need of the hour is to hold the element of ‘Leadership and Influence’ very high while exploring new professional horizons and paradigms with our time-tested tradition of professional excellence, ethics and integrity in the service to our nation. As endorsed by the founding fathers of our nation, we have been successfully assuming the mantle of leadership and influence in the fiscal discipline of the country as partners in nation building since the ICAI's inception in 1949. My aim is to augment that exalted position of leadership, particularly through our role as regulator and facilitator to government, professional fraternity and society at large. Peter F. Drucker says: Management is doing things right; leadership is doing the right things. While we know how to do the things right with dedication and integrity, we also need to be in leadership roles in order to do things right in the best interest of national and world economy. “Chartered Accountants: Partners in National Development” - These words of acknowledgement and recognition used by our visionary former President of India, Dr. A. P. J. Abdul Kalam for Indian Chartered Accountant fraternity amply sum up the great role, power and potential of the Accountancy profession in the country. As endorsed by the founding fathers of our nation, we have been successfully assuming the mantle of leadership and influence in the fiscal discipline of the country as partners in nation building since the ICAI’s inception in 1949. My aim is to augment that exalted position of leadership, particularly through our role as regulator and facilitator to the government, professional fraternity and society at large. To this effect, our Disciplinary Committee, Ethical Standards Board, Financial Reporting Review Board and Peer Review Board are putting extra efforts to fulfil the ever increasing expectations of our stakeholders. Further, taking our leadership role forward, we have intensified our mutual interactions with Ministry of Corporate Affairs, Ministry of Finance, Ministry of Human Resource Development, Reserve Bank of India, Securities and Exchange Board of India and Insurance Regulatory and Development Authority besides a host of other government departments. I am sure you will agree with me that understanding the immense benefits of convergence to IFRS and its implications is one of the most important business imperatives today. You will appreciate that this convergence will bring us a golden opportunity to comprehensively reassess financial reporting and a clean sheet of paper approach to financial policies and processes, while helping our economy at large, including our industry and investors. Our capital markets will be more robust, and there will be a new flow of foreign investments into our country. Weighing these and many more benefits of convergence, we recently have finalised a new roadmap for implementation of the Indian Accounting Standards (Ind AS) converged with the IFRS and submitted the same to the MCA for its consideration. The new Companies Act, 2013 has also introduced various new provisions, including the requirement to prepare Consolidated Financial Statements, which would also facilitate implementation of Ind AS converged with IFRS. This scenario opens a big window of global opportunity for us as Chartered Accountants. Post-convergence, services of IFRS-trained Indian accounting professionals will be in great demand globally. (1) Fraud Reporting: The new Act provides that if an auditor of a company, in the course of the performance of his duties as an auditor, has reason to believe that an offence involving fraud is being or has been committed against the company by officers or employees of the company, he shall immediately report the matter to the Central Government. It is felt that the provisions thereof are apparently quite onerous from the statutory auditors’ perspective. (2) Rotation of Auditor: ‘Rotation of Auditors’, a nascent concept across the world, has now been rightly restricted only to a certain class of companies, leaving close to 90% of the companies outside the scope of Rotation of Auditors. (3) Number of Audits: On the issue of the cap of 20 companies that can be audited, we firmly believe that limiting the number of companies that can be audited by an auditor is not advisable. With technological advancements, CAs will be able to cater to the audit needs of a much larger number of companies. A representation in this regard has been submitted by us to the MCA. (4) NFRA: We welcome the development that NFRA (National Financial Reporting Authority) provisions, that will give rise to multiplicity of regulators, have been kept on hold. While this gives us time to address our concerns, we are also hoping the MCA to see merit in our regulations and thereby avoid imposing, overlapping regulatory domains and responsibilities. The ICAI must retain its role to monitor accounting/ auditing practices since it has already been taking action against its erring members. I feel that though the Companies Act, 2013 is broadly a welcome way forward for India, its implementation and impact pose daunting challenges to professionals, including us. As such, the need of the hour is to take these challenges in our professional stride and leverage them to our advantage. Here, I must assure you that we at the ICAI are completely in sync with the situation and have charted a definitive and timebound course of action to help our professionals be at the forefront of this transition. The first and foremost task before us is to make our members familiar with intricacies, new concepts and procedures introduced for the first time in the law. This is being taken care of through a chain of seminars, teleconferences and new publications besides leveraging technology in the form of e-book, videos, and webcasts to reach maximum audience. Another challenge is to provide necessary guidance to our members for critical areas like reporting of frauds, rotations of auditors, corporate social responsibility expenditure accounting, cap on number of audits, etc. I am pleased to inform that our respective committees have already been activated in this regard. For instance, an expert group has already been formed to examine fraud reporting provisions, identify practical implementation issues and develop appropriate implementation guidance for the auditors at the earliest to help us meet the requirements of Section 143(12) and the related Rules. Further, the secondary impacts of the new law are also being analysed and duly covered in our areas of activities. Last but not the least, we are also preparing ourselves for the opportunities that will come to us in the form of CSR Audit, Internal Audit, and Independent Directorship for our members, etc. All this was discussed threadbare at a special meeting of the Council, and I am sure that with our collective effort and effective collaboration, we will put ourselves in the leadership role on this new professional frontier. While I am happy to note new professional horizons having emerged in newer realms of India’s knowledge economy, I am concerned at the proposed limiting of our scope in the recently released draft Direct Tax Code (DTC), 2013. Please note that all of us in the Council are very much aware and alive to the deep anxiety, apprehension and dismay gripping our fraternity following questionable dilution of the term 'accountant' in the DTC, 2013, which opens the hitherto exclusive and specialised tax audit practice and some other certifications to certain other professionals too. We strongly oppose the relevant Clause 88 & 320(2) of this draft as these defy the very logic and trust with which tax audit was put in the CAs' domain under Section 44AB of the present Act. Audit reports, specifically Tax Audits, Transfer Pricing Audit, Report as per Section 115JB/115JC and the like demand deep understanding and knowledge of accounting and relevant laws of compliance, which can be catered to only by the CAs, given their high-quality training, expertise, special aptitude, long experience and professional panache. CAs have been very ably and deftly doing these assignments for years, as can be vouched by the authorities themselves. It is a fact that various provisions in the Income-tax Act, 1961 under which Chartered Accountants have been given the responsibilities to undertake audit and certification of accounts of various entities have the emphasis on "audit" of the relevant accounts which is the exclusive domain of Chartered Accountants. Through a representation to the Ministry of Finance, we have placed on record our concerns not only for the profession, but for the country as a whole since issuance of audit certificates by persons having limited knowledge of audit of accounts will not only be professionally incorrect and but will raise many concerns including causing huge revenue leakages. Rest assured, we are taking our concerns to the highest level of Indian polity to make the government to see the merit of our stand on the issue. I am happy to inform you that taking our special drive for the empowerment of Women CAs for this year forward, we have recently launched a Flexi Working Portal for women members (http://womenportal.icai.org/). It will provide them a platform where they can explore suitable opportunities with option for part time jobs, jobs with flexi-hours or jobs with work-from-home facility. It will also help industry to tap talent pool which might not be accessible otherwise in the normal course. I request you to post your job requirement(s) having the option to work part-time or flexi-hours on this portal. I may emphasise that providing part-time/flexi hours option will be very cost effective to our practicing members especially SMPs who look for additional human resources during peak audit season like corporate audit, bank audit, tax audit, etc. I also request to all our women members looking for such flexi working opportunities to post their resume on the portal at the earliest. I believe in the power of ‘us’ and in the collective pursuit of continuous improvement, not only because these lead to performance gains but also effectually unify a professional community as remotely spread and diverse as ours. It is in that spirit that I hold the leaders of our regional councils and branches in high esteem. As such, converting that spirit into productive action, over the last month I personally met the chairmen of all our five regional councils and 147 branches. I utilised the occasions to not only learn from and draw on their experiences and vision but also orient them with the broad ICAI Vision, Mission and our Action Plan for 2014-15. The idea was to take them firmly along on the illustrious ongoing journey of our profession and the ICAI. I am highly satisfied with these meetings which provided me great inputs that will be help me steer our profession on the path of glory more effectively. I am happy to share with you that our path-breaking recent initiatives-‘ICAI Knowledge Gateway’ and ‘ICAI Mobile Application’ have received an overwhelming response from our stakeholders. More than 45,000 users have so far visited the Knowledge Gateway while about 89,000 users have downloaded the ICAI Mobile Application, and the count goes on. An overwhelming majority of our Mobile App respondents have given it five and four star ratings respectively. My vision is that accountancy profession and its enabling force–accountancy education, need to constantly go hand in hand with academic, technological and economic advancements globally. I have always believed that the ICAI needs to be vigilant to this need of the hour, and do a periodic review of the CA education and training schemes. As such, we have recently constituted CRET (Committee on Review of Education and Training). I am sure this will go a long way in benchmarking our CA education with the best in the world. I would like to re-emphasise that I see our alma mater ICAI more as a ‘facilitator’ than a regulator. As such, in line with my Action Plan for this year, we have set the ball rolling to make ICAI and its enabling base more robust in terms of ‘Human Resource’, ‘Infrastructure’ and ‘Technology’. Three specialised and focused non-standing committees- ‘HR Transformation Committee’, ‘Infrastructure Development Committee’ and ‘Technology Development Committee’ have been formed to take ICAI capabilities and competence to the next level of excellence. These will aim to set and follow high standards of responsive and responsible Human Resources of the ICAI, broaden and strengthen the infrastructure base for the profession, and put members and students on a new technology roadmap. I invite your valuable suggestions on these initiatives. 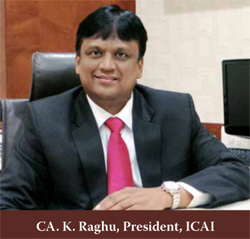 I am delighted to let you know that expanding the reach of accountancy profession in India, we have set up two more branches in the Southern India Regional Council of ICAI at Anantapur and Kurnool, which fall in the state of Andhra Pradesh. I am sure these branches will give our profession’s network an added strength. By the time you will be reading this, you must already be celebrating Spring and May Day. Let me congratulate all of you on that, which is celebrated on 1st May every year by many nations to honour labour, and by many others to welcome the Spring season that brings bright sun and happy sky to us. Seasons change for good of all. Likewise, we too should keep changing in tune with times for the good of our society and nation at large. In fact, I would like you to be ‘persons of all seasons’ and ‘leaders of change’. Let’s imbibe the spirit of a professionally relevant saying: A leader is one who knows the way, goes the way, and shows the way.